This topic contains 10 replies, has 4 voices, and was last updated by shrewsburywolf 4 years, 1 month ago. I love these pictures showing the wonderful evocative billposters of the day ,The theatre Programmes, household products of the day etc… some of these were works of art. This photo can be accurately dated by The film showing at the Odeon in Skinner Street that week, was “The Conqueror” a crap film to say the least starring John Wayne as Ghengis Khan. released in 1955 (Which incidently was the year I went in to the Army) Thank God I missed it. The car enthusiasts will tell us the types of vehicle being used then by the Taxi Drivers, fronting the hoadings. But all I want to know the destination of the people at the bus shelter on the left. Seem to remember that the bus destination outside the Co-op was West Bromwich (pardon me for swearing). And as an ex-Joey boy the facilities beneath the hoardings in Victoria Square certainly were a convenience on many occasions. A bit of a tricky one , Billy. There were two bus stops in close proximity, both outside the old Co-op department store. The one with the shelter was for the Thompson Avenue route. I cannot remember the number of the route but the terminus was on a triangle just before the start of the Birmingham New Road on Parkfield Road, The stop in front was for the no, 30 which went to Rough Hills. Wolverhampton Corporation played about with the route on a regular basis. Initially it stopped at Hardy Square and later they moved the terminus to the top of Rough Hills Road. By the time I left the area in 1968, the No 30 started in Queens Street by the old Army Information office. It would have been the no.30 that you caught to St Joeys, travelling down Pipers Row, Bilston Street before going down Steelhouse Lane and stopping by the Summer House pub for the school. You are spot on with the answer I wanted Dek. I would catch the returning bus sometimes from the stop in Vicarage Road (opposite Maxwell Road ) after a day at St Josephs School. I can’t recall a bus going down Steelhouse Lane in the late 1940’s though, when I started at St Josephs our alternative was the Bilston bus from outside Weddell’s in Victoria Square, hopping off at the Horse & Jockey ,and racing (always late) up Steelhouse Lane. Thank you and keep following…..
My mistake – I’m getting my decades mixed up. The No 30 route which would have dropped you off outside St.Joey’s on Steelhouse Lane did not start up until the mid 50s after the Rough Hills Estate was completed. For a year or so before then my parents used the Thompson Avenue route and got off at the Black Horse or they took a Bilston bus which stopped on Bilston Road by Steelway and the New Inn at the bottom of Dixon Street. Opposite the two bus stops in Lichfield Street were the Victoria Hotel and Grand Theatre. Waiting for the bus to arrive, we often spotted TV ‘stars’ who were taking part in the Christmas pantomime or plays at the theatre. The hotel had a good reputation in those days and I remember the Spanish flag flying outside when Barcelona played Wolves in a European competition around 1960. The team were staying there – we hung around for autographs without success. Always good to spot a link to the Thompson Avenue area on your site. I will check up regarding the West Brom stop Terry Did I mention before Don Howe is a relation of mine Please don’t hold it against me. I did wonder if you were related to Don, I was aware he was from Wolverhampton and knew went to St Peter’s School. No worries, I won’t hold it against you. Don’t suppose you are related to a John Howe, I worked with him at a printers in Shrewsbury for a time, he lived in the Dawley area of Telford? No Terry no relation to my knowledge although I have a son. John living in Wolverhampton. 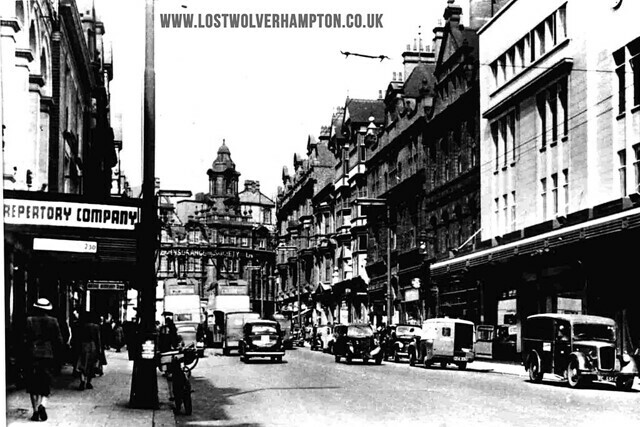 Talking about Wolverhampton .You did say you might pop in to John Neave Printers at sometime and have a chat. Well once a year the Shrewsbury Branch of the small Printers association come along to John’s for the day usually about 8 or 9 of them. I believe they are coming in March date to be confirmed , perhaps you could make it that day. Terry’s right about the West Brom bus stop outside the Co-op Billy. I used to walk my then girlfriend, now the missus, to the stop regularly. I believe it was the number 79. It ran along the Bilston Road past the New Inns and Steelway, and then on to West Brom via Wednesbury. 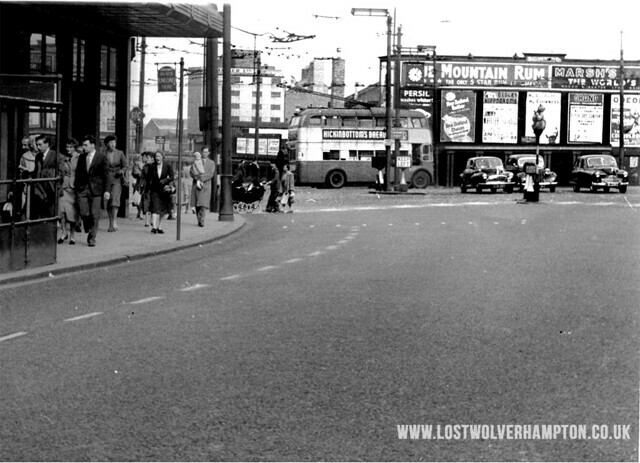 The main reason I think the bus stop outside the Co-op was for West Bromwich (sorry for swearing), was because I used to cach it there when going to see Wolves play at The Hawthorns. On other occasions we get the train to The Hawthorns Halt.